SINGAPORE (Mar 18): In the last few years, well over US$42 billion ($57 billion) a year in total turnover was seen in the international watch market, which has more than 850,000 players. The market is dynamic and growing, declares Swiss watch expert Eric Tortella. Tortella says in the past four decades, some 55% of international auction sales proceeds was derived from Patek Philippe timepieces alone. In the last three years, Patek Philippe, which has 1,500 employees, produced an average of 40,000 watches a year. Other top brands produce much more, he notes. Rolex, for instance, with 5,000 employees, produced about one million watches within a similar time frame. Patek Philippe’s exquisitely crafted watches have enjoyed a steady appreciation in value over time, he notes. An iconic brand that has remained an industry leader over two centuries, it is the last watch manufacturer to remain independent. It takes at least eight months or more to produce a Patek Philippe timepiece, Tortella says, and much longer with more complicated pieces. The limited production process adds to the higher retention value, along with the fact that every watch element is made to the highest standards. Tortella was in Singapore recently for a private event organised by Christie’s Singapore. A watch industry veteran of nearly 40 years, he says that precise and detailed hand finishing of a timepiece adds immeasurably to its value, as well as its lifespan. Wheels laboriously gilded and cut, jewels optimally positioned to minimise friction and bridges rounded and polished are just part of the painstaking process. 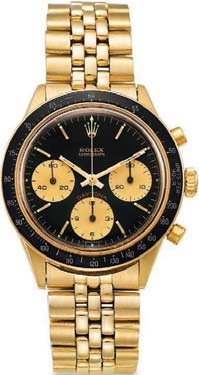 How does one ascertain the value of a watch and if it is auction-ready? Tortella points out, “The originality of the timepiece, its condition and rarity, as well as the history behind it matter.” Also important are the number of pieces made, the movement and case manufacturing year. A vital point to note is whether any modifications were made. Available paperwork such as certificates and data extracts also help in the valuing process, as do accompanying accessories such as the box in which the timepiece was placed in. Provenance is also key, like who the original owner was. Also, was such a timepiece already known and offered to the public? Do not forget to read up on production data on cases, dials and bracelets, the latest market updates and reports, history and evaluation of prices, as well as the in-depth technical inspection process. But beyond monetary value and auction readiness, Tortella emphasises the heart of Patek Philippe’s core values. “There is also the much-cherished tradition of handing down such splendid watches through the generations,” he says. For Christie’s upcoming “Important Watches” sale in Dubai in March, highlights include a unique steel Rolex ref 4500 tropical dial with a Joyería Riviera signature, contemporary minute repeaters, rare grand complications and a 1964 Rolex Daytona 6241 with the coveted cherry logo. The Dubai watch sale is complemented by Christie’s sale of Middle Eastern, Modern and Contemporary Art. Viewing is open at Christie’s Dubai salesroom at the Jumeirah Emirates Towers Hotel from March 19 to 23. The auctions are on March 22 and 23.